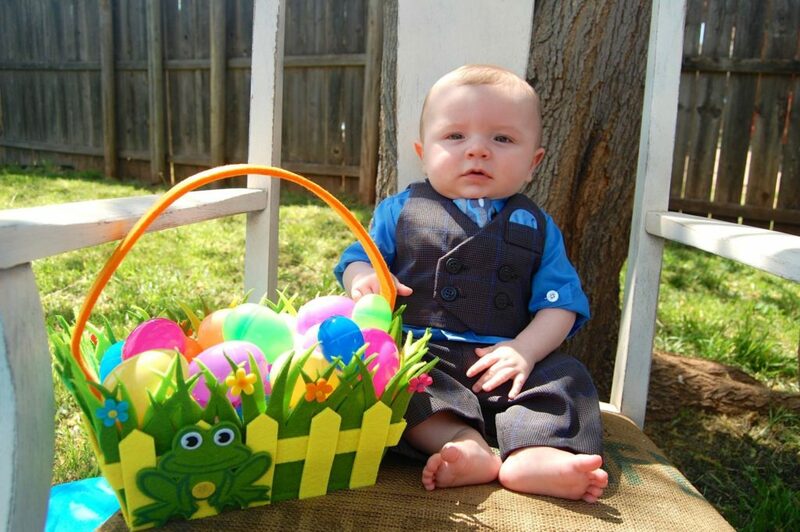 For Teddy’s first Easter, we went all out. The kid wore a full suit with matching pocket square (given to us by my hubby’s boss, who insisted every future lawyer needed a good suit – lol). We staged a zillion photos – the outtakes of which turned out better than the “real” thing since the kid couldn’t even sit up on his own yet. My parents came in town to celebrate the long weekend with us. (Thanks dad for the “save” when he started falling out of his chair!) 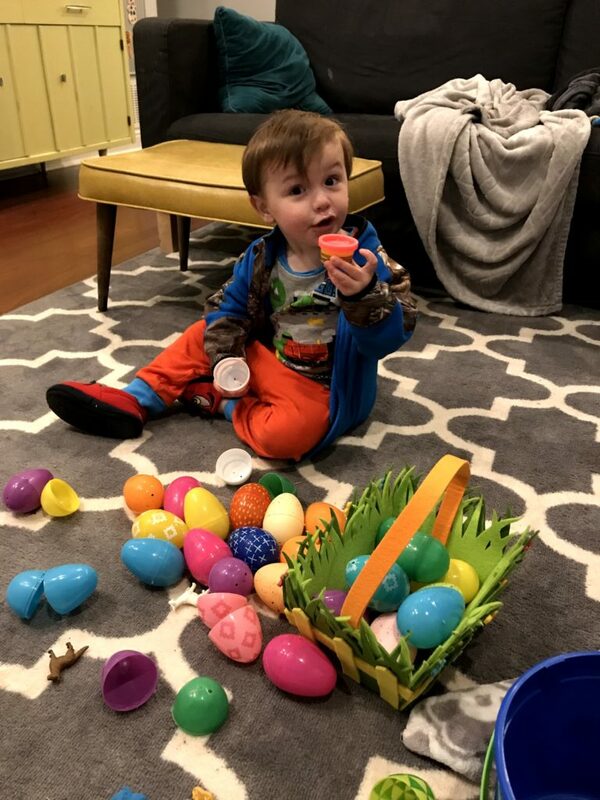 But the eggs were mostly photo prompts and we didn’t stuff them – just let him play with them and I think his only gift was maybe a Bible story board book. 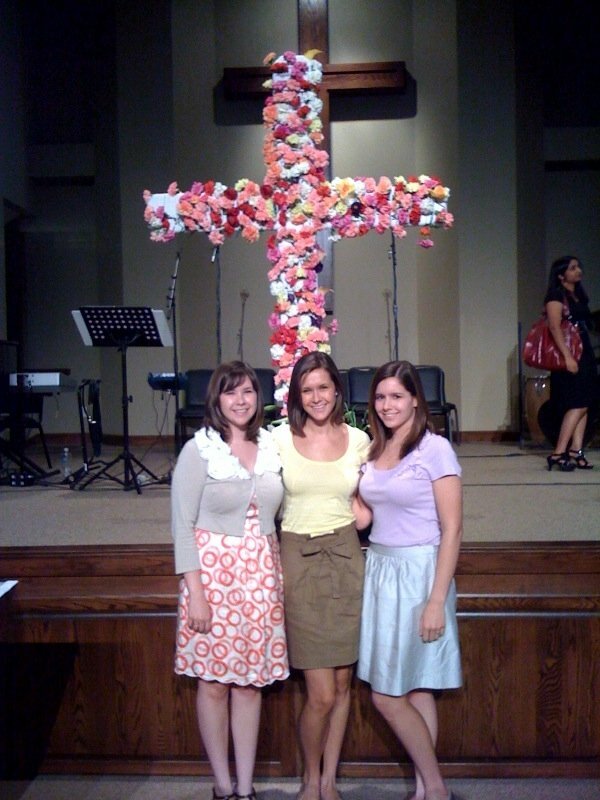 We purchased a special outfit, but opted for something a little less formal. 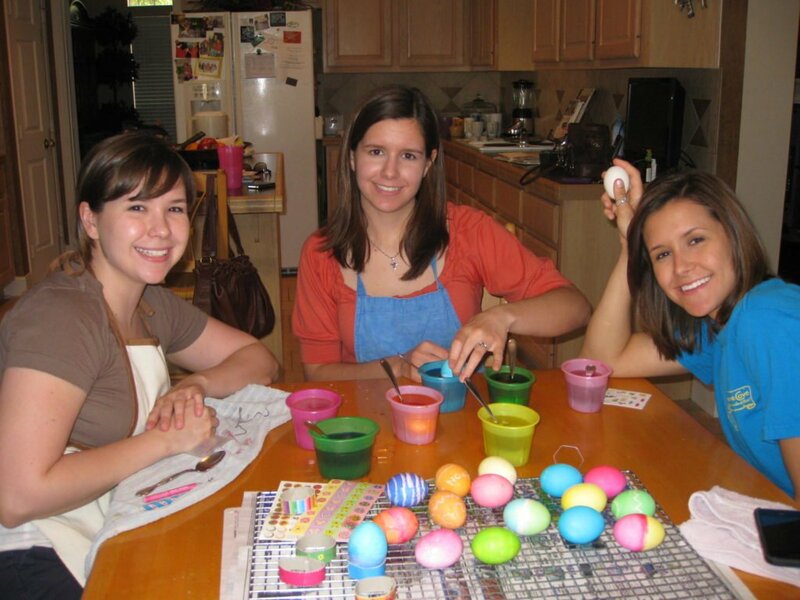 We spent considerable time searching for the perfect non-edible egg-stuffers that were cheap, non-choking hazard toys because we were still on the “our kid will never taste candy” delusion train. 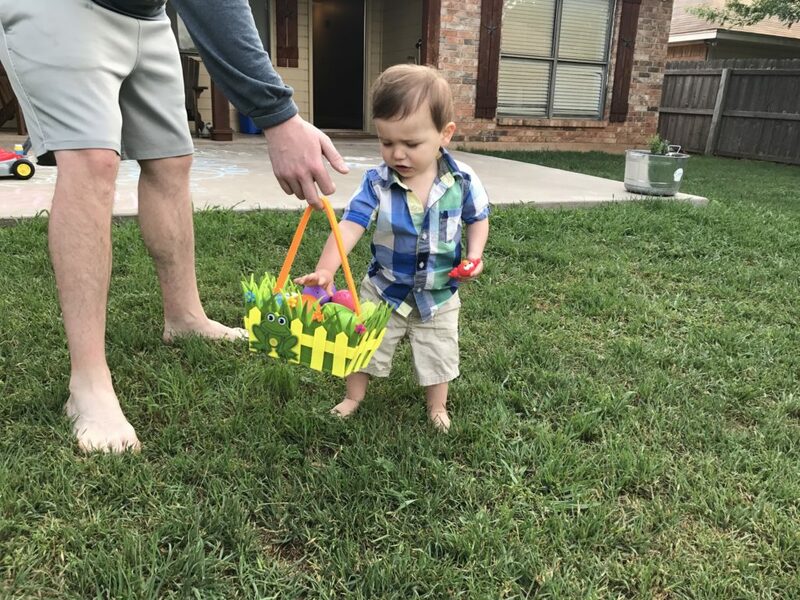 We also practiced picking up things and putting them in a basket a solid two weeks before the big day, so he would be prepared. But that was really about it. 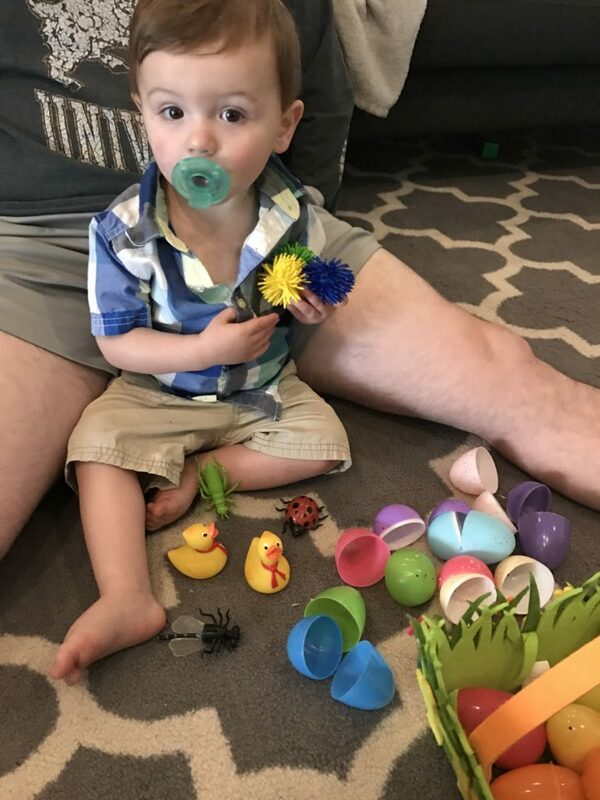 No elaborate gifts, just some plastic toys and a dozen or so eggs. 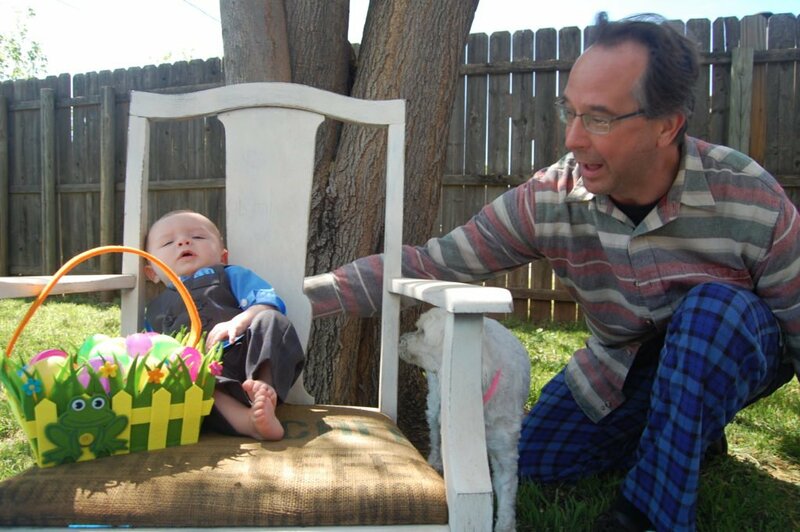 This year, Teddy got not one, but FIVE Easter baskets. 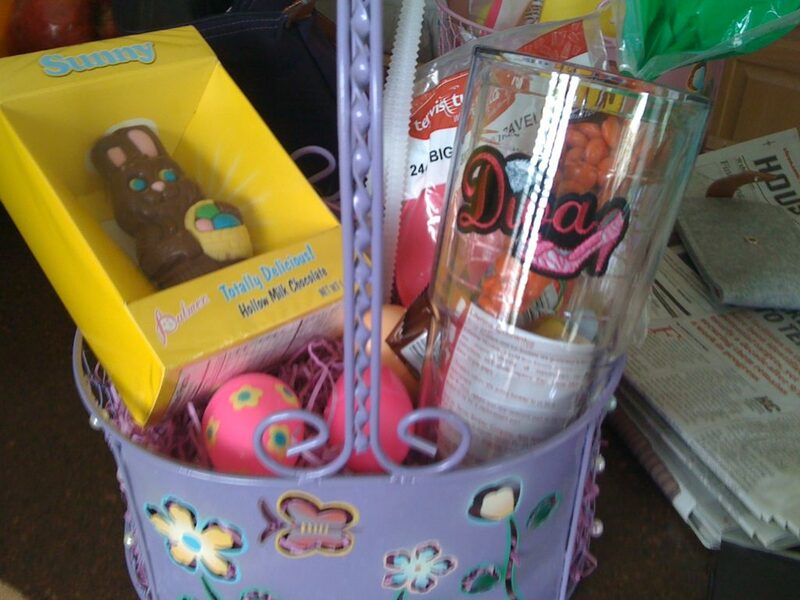 Three arrived early, all stuffed with gifts – one from my MIL, one from my parents, and one from our dear friend Susan. 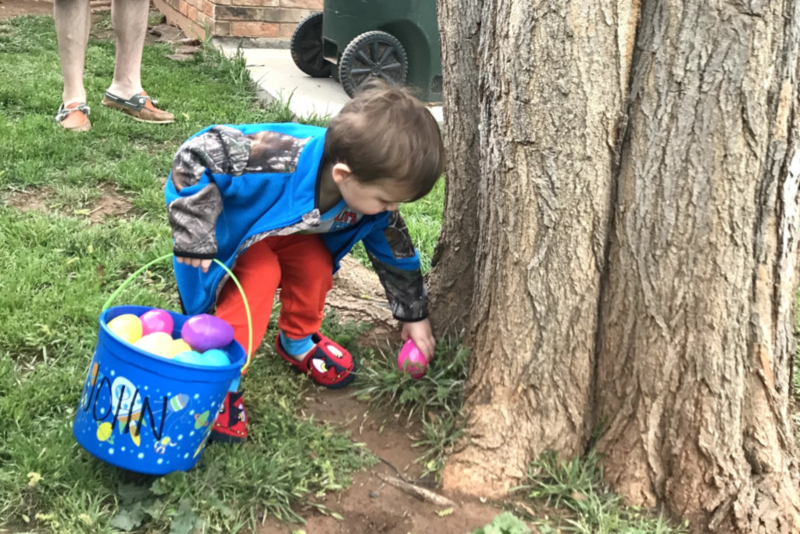 PLUS the Easter egg hunt at preschool. By Thursday of last week, I had resolved not to get him anything else. Then, my emotions got the best of me. 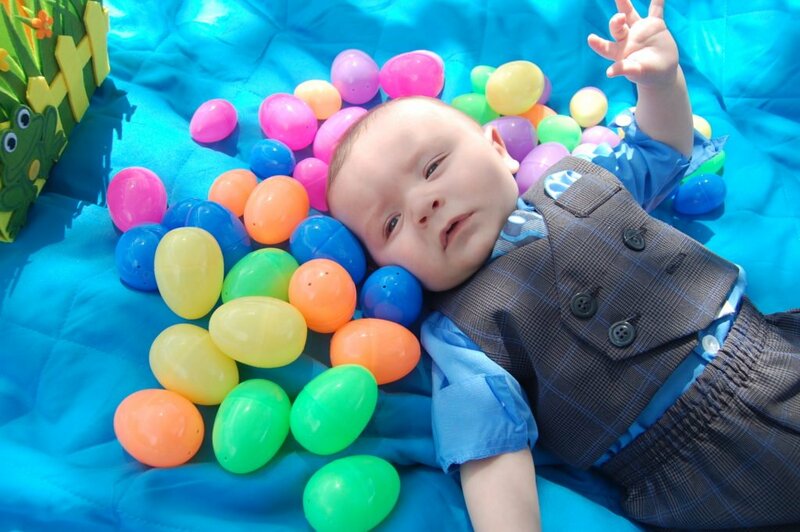 The poor kid is going to wake up Easter morning with NOTHING? 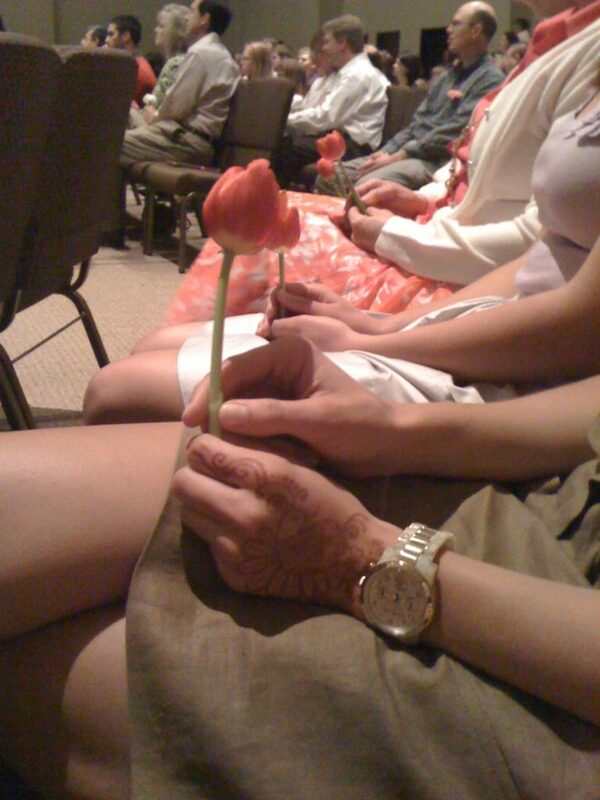 (Nothing but you know, the SALVATION of Jesus Christ offered freely to him. You know, THAT.) 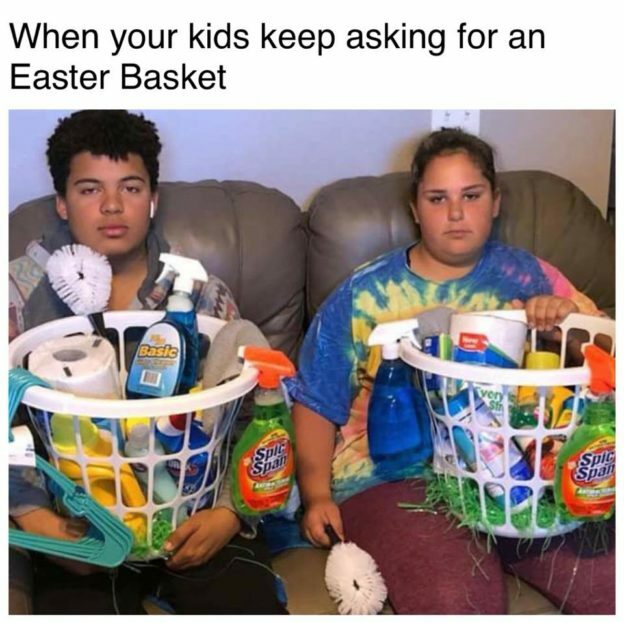 But no gifts, no egg hunt? So Saturday, I went a little nuts. We bought tiny Play-dohs and farm animal figurines and stuffed oh, about four dozen eggs. (So many he had to use his bucket from preschool to collect them because his keepsake one was too small.) 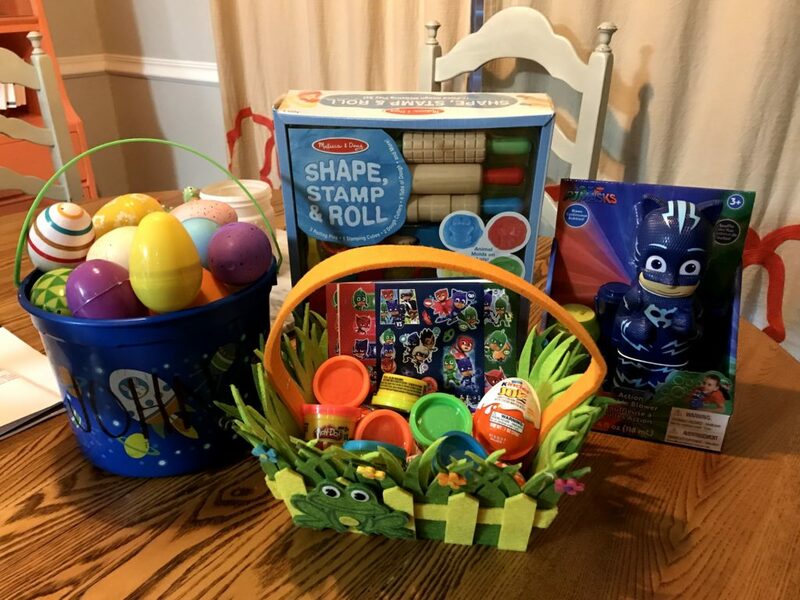 His basket gifts included more Play-doh, Kinder Eggs, stickers, a Cat Boy bubble machine and Play-doh “shape, stamp and roll” kit. 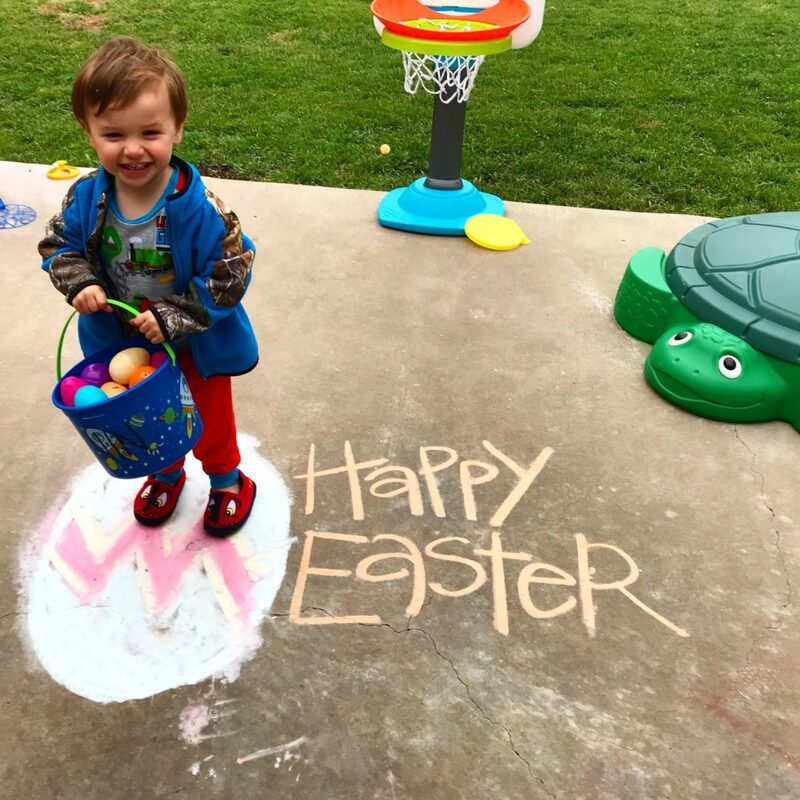 Outfit wise, the kid bounced around in our backyard looking for eggs in his pajamas because goodbye photoshoot, hello toddler years. Eventually he made it into khakis and a button-down plaid shirt, but this was something we already had on hand. 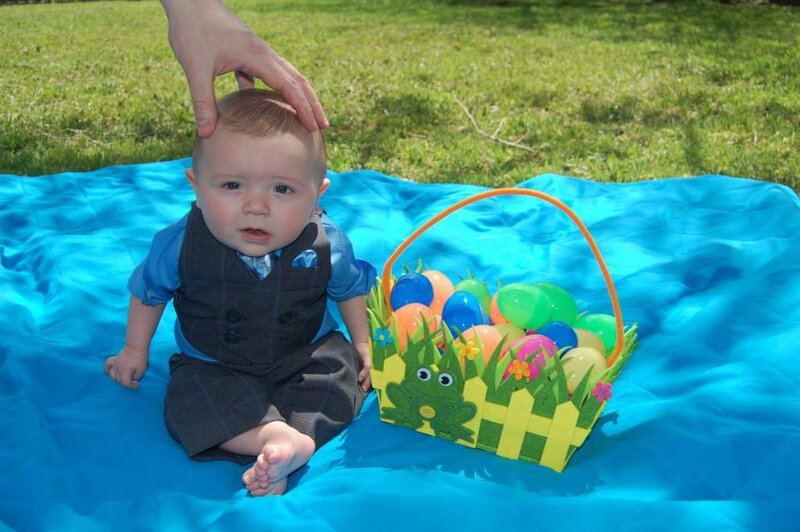 I realize at two years old, his comprehension of the Easter story (and even the concept of death) is about zero. 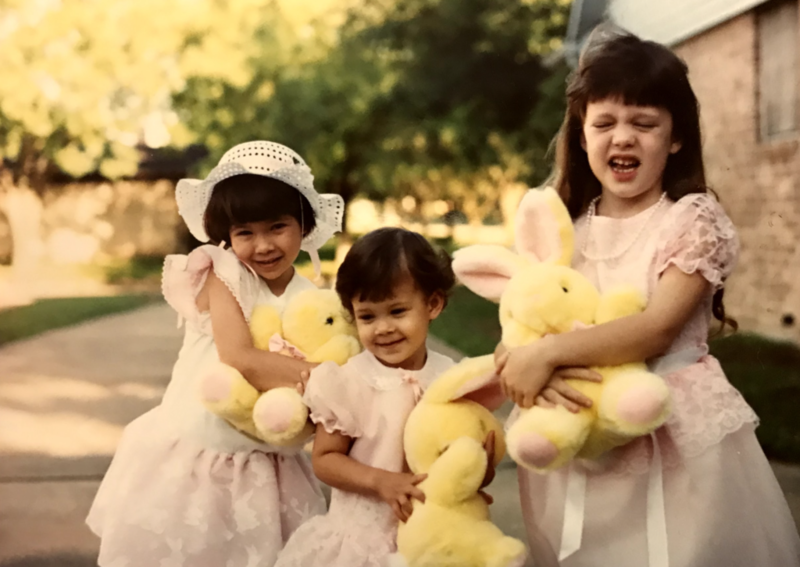 But I feel like we are coming to a point very soon where his awareness and understanding will increase, and I worry about how all of these material things will mesh with the abstract idea of why we are honoring Easter at all. To be honest, I feel a little guilty for all the materialism that went down on Sunday. 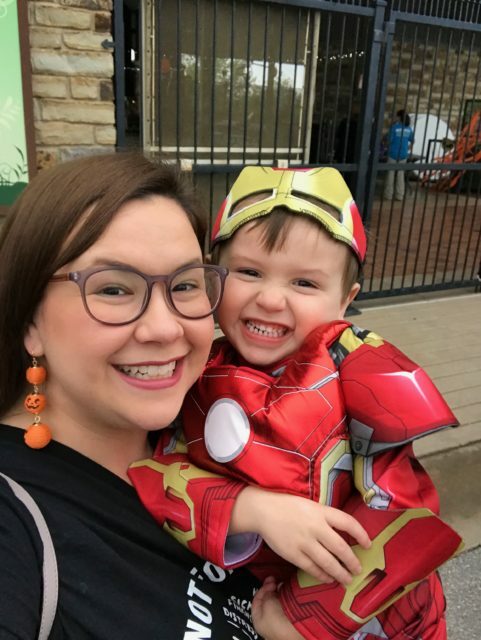 It’s something I never really considered before becoming a parent, but WHEN does all the holiday fanfare become too much? When does it turn from celebration to distraction? How do you find balance with your own family? 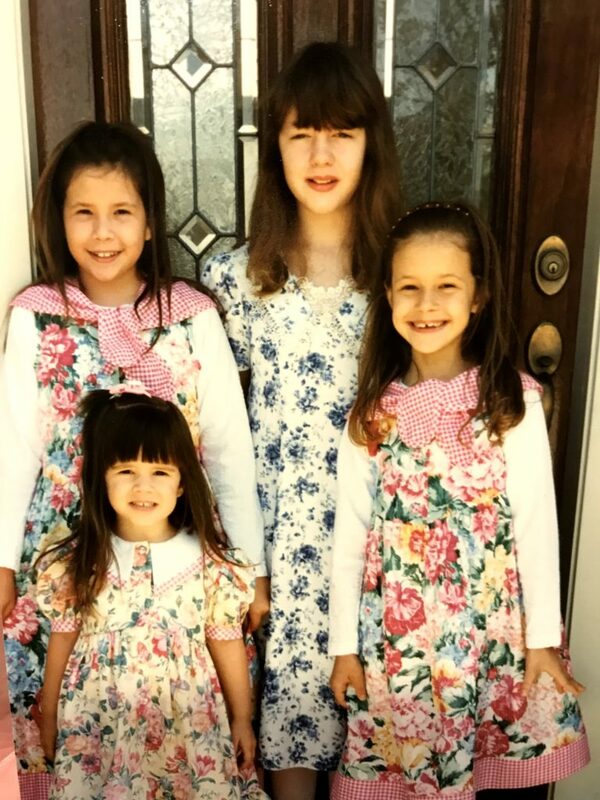 How has that evolved as your kids age? The meme I chose for the photo at the top of this blog post cracks me up, but honestly I don’t really agree with that mentality either. I don’t agree with the idea that holidays are the time to try to course-correct and rebuke kids for having the wrong mentality about why that day is special. The day is special. Let’s focus on why we are celebrating, and maybe why gifts aren’t a necessary part of making that day matter.